The water level on Strathclyde Loch had recently been reduced and this meant that large areas were now dry. This provided an opportunity to see if there were any additional species from the normal black-headed gulls, Mute swans and Goosanders on the loch. Strathclyde Country Park was constructed in the 1970's and the Loch is situated on the site of a mining village called Bothwellhaugh. In the 19th century it was owned by the Duke of Hamilton and in 1850 several collieries were developed on the site when extensive coal seams were discovered. The Bent Coal Company leased the mineral rights and sunk two pits on the site, known as the Hamilton Palace Colliery. The Bent Coal Company build houses for the miners and in 1910 there were 965 staff living in 458 houses of various sizes and only a few of them had baths.The pits provided work for over 1400 people and 2000 tonnes of coal were excavated from the site. The colliery was closed in 1959 and the village was demolished due to the buildings falling into ruin. Although legend has it that the village lies submerged under the loch, it was in fact demolished before construction of the park in 1974. At the main watersports centre a few rowers from Heriot-Watt University in Edinburgh were preparing to get some practice on the loch. 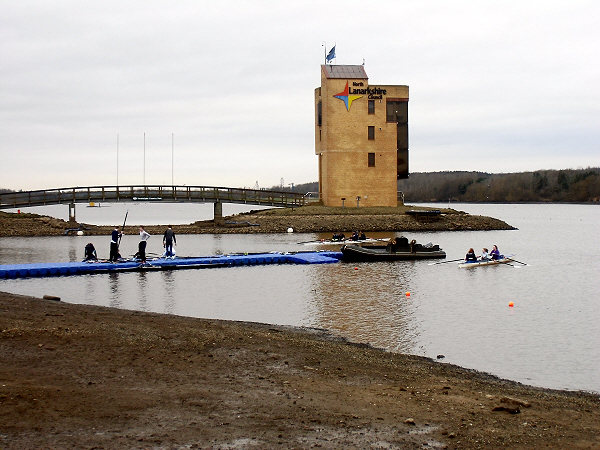 The Scottish Rowing Centre is based in Strathclyde Park and many rowing events are held on the loch. In 2014, it will be used for the rowing and sailing events during the Commonwealth Games. 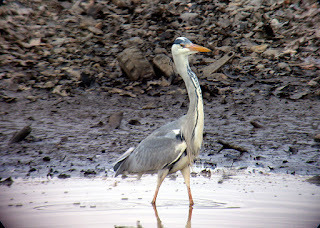 I walked to the park carrying a large spotting scope (Zeiss Victory DiaScope 85mm with a 20-75 zoom eyepiece), a carbon fibre tripod and a small shoulder bag with my binoculars, bird book and notebook. This was quite heavy to carry, but I have got used to the weight by now. Meeting up with some friends, we walked in an anti-clockwise direction to the 'beach' area which always has many birds which have become quite tame as a result of being fed by visitors. The usual birds were there and could be observed without the aid of optical devices. We carried on to the island area and saw some Goosanders, but they moved quickly away before we could get the scope set up to take photographs of them. 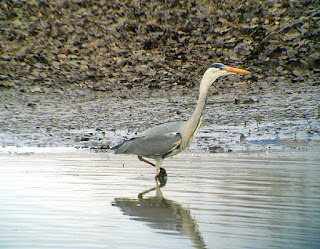 Walking further along, at the Foreshore area, we were rewarded with a large colony of birds, including a Heron. 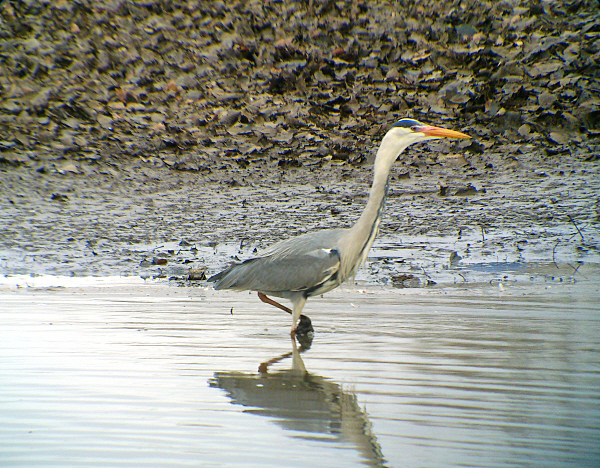 We managed to take some photographs of the Heron through the scope - it was busy walking up and down looking for food. The area must have been quite productive as it kept catching some small items of food. 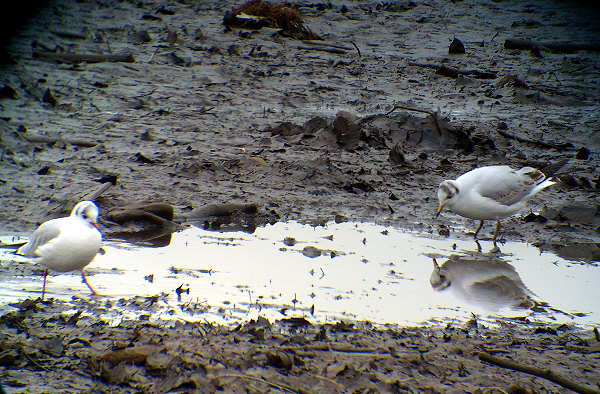 Some Black-headed gulls were spotted searching for food in a small puddle. 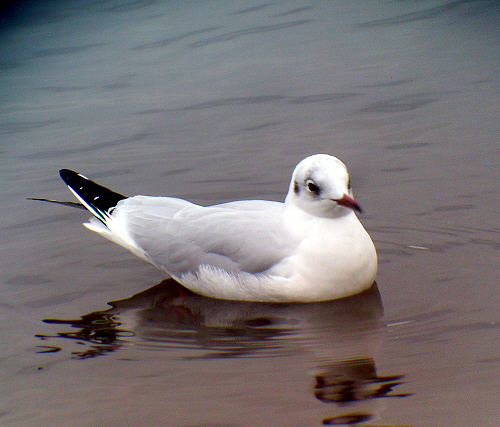 In the winter months the Black-headed gulls have lost most of the solid colour (which is brown and not black) they have in the summer. 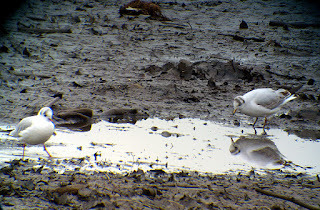 There were some other gulls in the distance but they were too far away to take photographs with the scope. While we were watching the Heron, a middle-aged couple asked us about the birds and were thrilled to observe them through the scope. They said they became interested in birds when they started walking through the park a few years ago. They kept us company and walked back with us to the watersports centre. 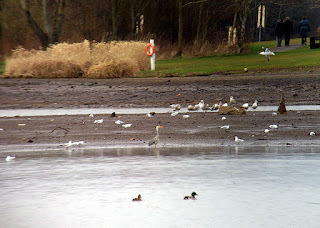 On the way back to the watersports centre we stopped before the 'beach' area and took a look through the scope at the area where we had observed the Heron. It was still there in among the Black-headed gulls and Mallard ducks. 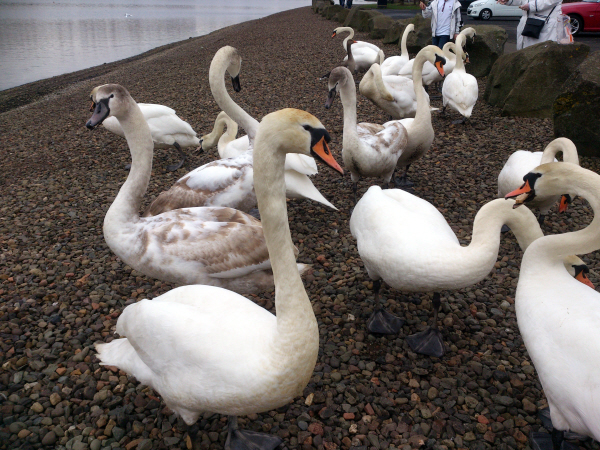 Arriving back at the watersports centre we saw some Mute swans being fed bread by visitors. Our day had been very enjoyable and we had managed to get some good photographs through the scope.